You can click the picture above to see larger version. New Illustration for you Bigfoot Lunch Clubbers. As most primatoligist and anthropologist know, we humans share a classification called Homindae which includes Pongidae (the three/four other great apes; Gorillas, Orangutans, and Chimps/Bonabos). Well, obviously BF would fit into that class as well. 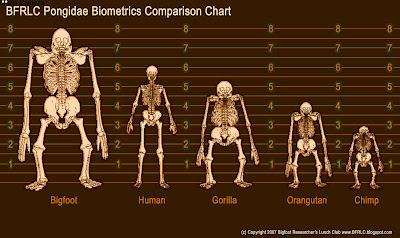 Above are the skeletons of the homidae/pongidae family, notice different porportions such as a a gorillas wider torso, orangutans longer slimmer build, and the chimps thicker, stockier leg bones. The BF skeleton is a blend of a Gigantopithecus reference and the Patterson film. New Illustration for you BF Lunch Clubbers. As most primatoligist and anthropologist know we humans share a classification called Pongidae with three/four other great apes; Gorillas, Orangutans, and Chimps/Bonabos. Well, obviously BF would fit into that class as well. Above is the skeletons of the pongidae family, notice different porportions such as a a gorillas wider torso, orangutans longer slimmer build, and the chimps thicker, stockier leg bones. The BF skeleton is a blend of a Gigantopithicas reference and the Patterson film.